Last month we added a new Jazz music font, Petaluma, which comes with Petaluma Script, a handwritten text font. The obvious next step for us was to add the ability to customize texts, and that's today product update! 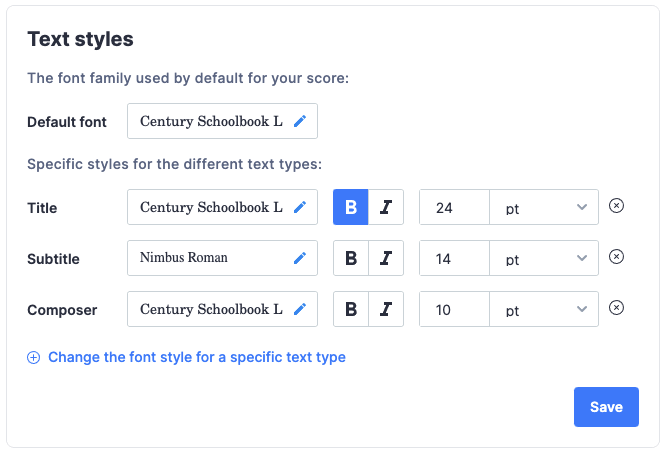 This update includes over 150 libre licensed fonts from Google Fonts that you can now use in your scores. More will be added in the upcoming months, based on your feedback. ... then adjust the different text types settings: font family, weight and style. Text types include the title, subtitle, lyrics, part names, and many more. We also took advantage of this release to change the default text font used in the scores on Flat. We now use a more elegant font, URW Century Schoolbook L, instead of Noto Serif. This previous font remains available in the new fonts list. To learn more about this new feature and how to use it, check out our dedicated help page. Please let us know if you have any feedback regarding this update, we love to hear from you! You can now customize your keyboard shortcuts by adding your very own shortcuts and editing keys associated with existing actions. Discover how in this product update.